Designed for the best overall ride comfort and performance in mind, this complete lift kit is the best lift on the market. Designed for the best overall ride comfort and performance in mind, this is the most complete lift kit on the market. 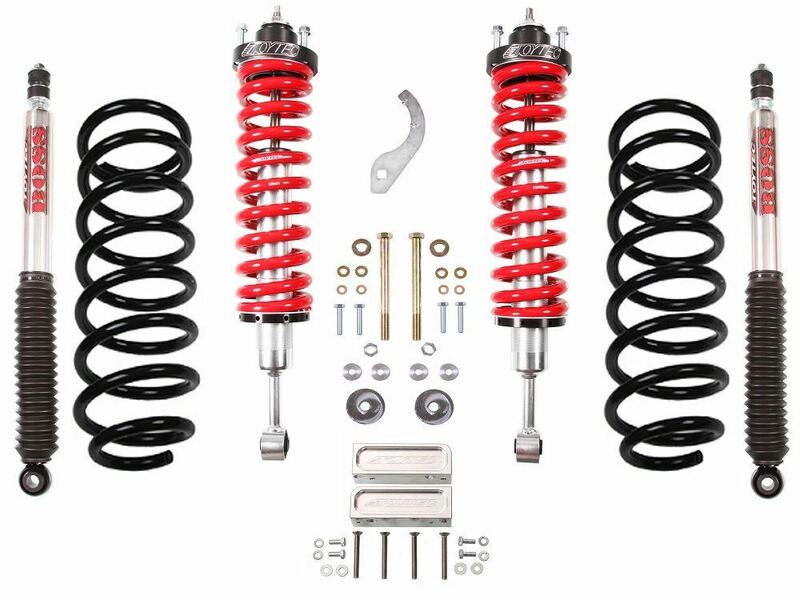 TTFCS2005- ToyTec’s BOSS standard 2.0 front Coilover -designed with a larger 5/8” nitro steel shock shaft which is much more corrosion resistant than chrome plating and is valved specific to your vehicle, improving the overall handling and performance. The threaded Clear-Blue Chromate zinc plated steel shock body is adjustable from 0-3” of front lift height and can be fine tuned to level your truck side to side and front to back. Each shock has a 200 psi gas charge and is dyno’d before it ships. Upper mounts and adjustment rings are machined from 6061-T6 Billet aluminum and are then anodized black to prevent corrosion. TIG welded spanner wrenches are included for easy adjustment. Comes fully assembled and ready to bolt on for easy install. Includes sway bar relocate bracket needed for clearance. All parts are 100% made in the U.S.A. Choose coil spring rate and color options above. Toytec Signature rear bump stop drop Kit- Part # RM43006 - Designed to work with our Superflex rear coils allowing your rear bump stops to function properly protecting your rear shocks from damage and keeping the rear tires from hitting the fenderwell. Toytec Rear Superflex Coils: - Our BOSS kits comes standard with Toytec RCC2.0 rear springs- These springs offer 2" of lift with stock rear weight with the best overall ride quality and rear articulation. Optional HD Rear Superflex coils offer additional weight capacity. Recommended 150-200 lbs of constant load for 2-2.5" of lift. TT-75110RR - Rear BOSS 2.0 Remote Reservoir Shocks. For additional performance, the remote reservoir shock will hold more oil to prevent shock fading on rougher applications. Total Chaos Uniball Upper Control arms - 96504 - Maximize your wheel travel and increase your strength while also correcting alignment angles. 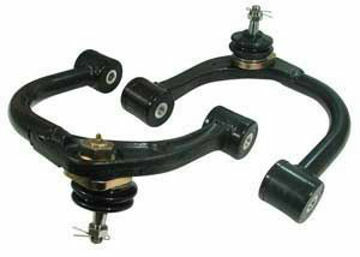 SPC Adjustable Upper Control Arms - 25480 - The most adjustable UCA on the market. Correct your alignment angles. Also great to help with adjusting for tire clearance.